I don’t know about where you are, but around here, we’re all exhausted. It’s the end of the first week of classes at TLU, and everyone is frazzled. This makes me happy. Why? Because I don’t feel so bad about being frazzled myself. Everything is new for me – the names of the buildings, the code names for the groups on campus, the names and faces of students, faculty, and staff, and this week, especially, the pace of life on campus. And taking in all this newness is wearing me out. It’s been all I can do to show up to events on time, in the right place, and with whatever presentation or sermon already thought out. It’s not like I’m some incredibly prepared person on a regular basis. Since becoming a mom, and a single mom at that, I regularly find myself in procrastination mode, throwing events together at the last minute, finishing a sermon just before putting on my alb to lead worship. And as a former perfectionist, I’ve come to terms with that reality. But the last couple of weeks have been worse than usual. Each morning I wake up and check the calendar: what am I supposed to lead today? And each night I fall into bed thinking “I hope there’s not something huge happening tomorrow morning that I should have planned for.” All I can do is whatever I’m supposed to do today. Like Scarlett O’Hara, I can’t think about all I’ll have to do later on. If I do, I’ll go crazy. I’ll think about that tomorrow. But in the midst of my panicky planning for the presentation I’m giving in 1 hour, a beautiful thing has happened: I’ve been living in the moment. Everything I’ve been doing is for right now. All of my conversations are about what’s going on today, what’s happening next. And in focusing my attention and heart and brain power on what’s right in front of me, my anxiety level has dropped. I’ve realized that all I can do is what I’m doing, and so my focus has been extra-sharp. I’ve eased up on trying to make everything spectacular, and so my fear of failure has been replaced with joy in the moment. I’ve been dependent on others to accomplish each project, and so I’m filled with gratitude for the student leaders and faculty and staff who are helping me along. Being present in the moment wasn’t my goal. Getting through a crazy schedule of events was my goal. But instead of trying to seize control of every detail and manipulate every outcome, I just let go and trusted that the Spirit would work through whatever effort I had to give. And that letting go and being present has made all the difference. Driving to yet another campus event last night, I pulled out of my driveway only to discover a beautiful rainbow in front of me. I could have missed it if my mind had been working out curriculum for next Wednesday’s Grace Place Bible study or my next sermon for Sunday night worship. But I wasn’t. 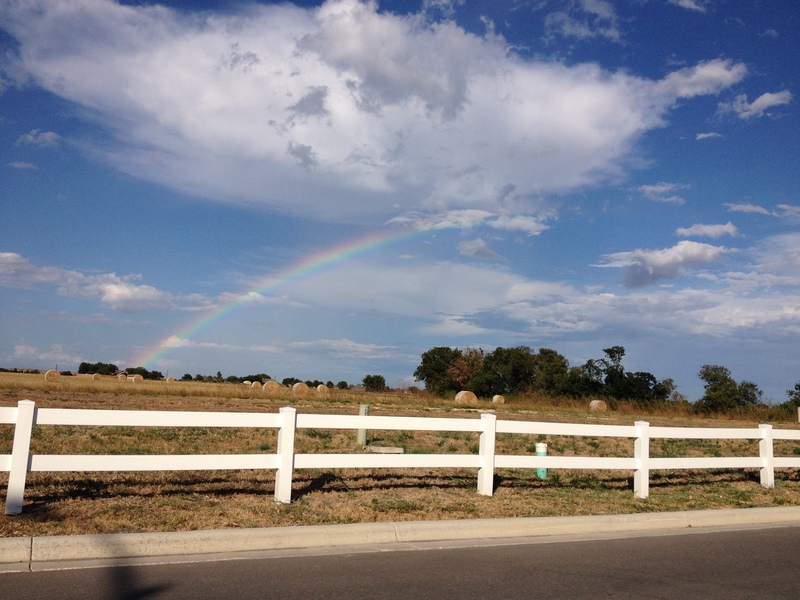 I was there, enjoying a moment in the car with my son, and noticing a small rainbow in the sky. I’m glad I didn’t miss it, because rainbows are one more reminder that God is ever present in our world, in each and every moment. Praying for all of us, that we can live in the present moment, and participate in God’s gracious action in the world.